An ancient Buddhist prophecy says, “When the iron bird flies, the Dharma will be spread to the west.” Most people who come into Mimosa and try their hand with Tibetan singing bowls are very much attracted to the sound, whether they’ve got any use for Buddhism or not. The funny thing is, this fits perfectly with Buddhist understanding of the singing bowls’ purpose.Beyond the use of singing bowls to signal the beginning and end of meditation, devout Buddhists use them in what they call “sound teaching.” This nonverbal teaching also incorporates conch shells, tingshas, and drums, each of these instruments having its own teaching. According to Lama Lobsang Leshe, the bowl’s message is “about broadness and emptiness” — not a mantra so much as an “emptiness teaching,” a transmission said to come from directly from the Buddha without needing words. Some monks even hold to a custom of never talking about the bowls, lest words themselves distort the essence of the teaching. It’s the purity of sound itself, they say, that allows the seeds of Dharma to sprout.A few ancient bowls are revered as holy relics. One, purported to be the begging bowl of an earlier incarnation of the Buddha, resides at the Drepung Monastery. When someone plays it, it’s said you can hear the quality of that person’s karma through the quality of sound the bowl allows them to produce. 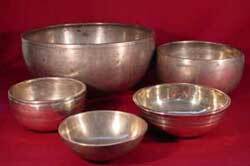 The most traditional singing bowls are hand-hammered, made of seven metals that correspond to the seven visible heavenly bodies: gold for the Sun, silver for the Moon, mercury for Mercury (duh), copper for Venus, iron for Mars, tin for Jupiter, and lead for Saturn. In the course of time people, have invented other types of bowls, such as crystal bowls and the Japanese rin gongs. Nowadays, their use may or may not be connected to Buddhist traditions. People in the west use them to mark transitions, not necessarily in a religious context. Singing bowls have found a place in classrooms, yoga studios, therapy offices, and even corporations. The lamas mostly seem to think this is a positive thing–a sign that the Dharma is coming into its own, spout in all places and among all peoples. How is the price? And how do you arrange shipment ? We’re a retail store. If you’re buying 100 bowls, you should go to a wholesaler.